REN21’s Renewables 2017 Global Status Report (GSR) shows how the 20 largest solar thermal markets in the world developed in 2016 (see the chart on the left). Significant growth was reported from Denmark (84 %), Mexico and India (6 % each). Except for the Danish market, last year was a challenging one for key European sales countries because of factors such as low oil and gas prices, declining demand from homeowners and reduced interest in solar thermal among installers. Consequently, there has been a notable decrease in market size in Poland (-58 %), France (-35 %), Austria (-19 %) and Germany (-8 %). The GSR 2017 was first presented at the beginning of June during the Clean Energy Ministerial in Beijing. China keeps its status as the biggest solar thermal market around the globe. It far exceeded others by adding 27.7 GWth (39.5 million m²) in gross installations in 2016, almost 19 times more than the second-largest market, Turkey. The downward trend in China since the country’s record year of 2013 has also had a negative impact on the global industry. Preliminary estimates by employees of Austrian research institute AEE INTEC, which authored the annual Solar Heat Worldwide study, showed 36.7 GWth to have been installed around the world in 2016, an 8.5 % drop compared to the 40.1 GWth set up in 2015. These estimates were based on 2016 data from Australia, Austria, Brazil, China, Germany, Israel, Mexico, Turkey and the United States, which together had accounted for 87 % of the cumulative installed capacity in operation in 2015. AEE INTEC projected growth in the rest of the world by looking at the trends developing over the past two years. Contributors from 20 countries (see below) helped create the global overview. Another set of preliminary estimates by the European Solar Thermal Industry Federation showed the EU 28 to have added 1.8 GWth (around 2.5 million m²) last year, a 6.4 % decline compared to the year before. 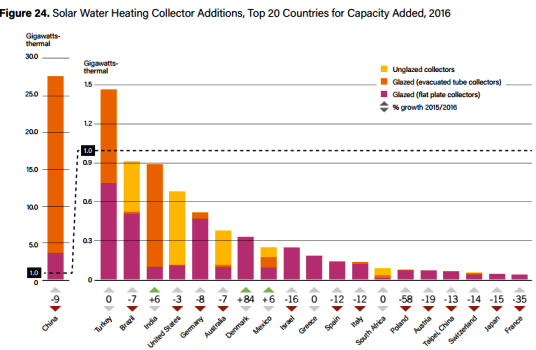 The report’s chapter on Solar Thermal Heating and Cooling can be found on pages 75 to 84 and the reference table, including the gross capacity added in 2016 and the end-of-year capacity in operation in the 20 largest countries in 2015, on page 172 (see the attached document). In addition to market growth and industry development, the GSR 2017 has been dedicated to trends and news about policies relating to renewable heating and cooling (see pp. 125 and 126). 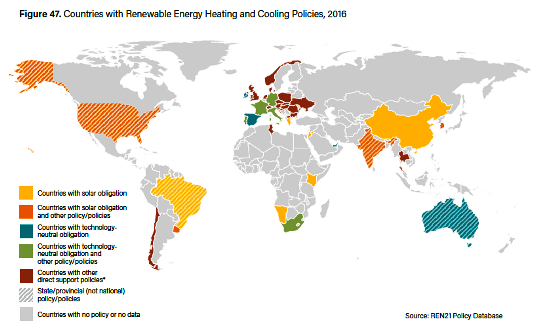 It is the first GSR to include a world map showing 41 countries with one or several support policies on renewable heating and cooling. Still, the market is lagging behind when compared to the 126 countries with renewable electricity schemes. The world map highlights countries with solar (11, yellow and orange marked countries) and renewable building regulations (10, blue and green marked countries ), direct subsidy or other support mechanisms (20, dark red marked countries). Please see the database of incentive programmes on this very website for more information on direct subsidy schemes. To search for solar and renewable building regulations, select Six Pillars > Policy > Obligation in the Advanced Search Tool on the left of the main page and type in the keywords you want in the field at the top. The growing share of renewable energies in national power grids will likewise require advanced infrastructure solutions. REN21 has drafted a new chapter called Enabling Technologies and Energy Systems, which may become relevant to solar heating and cooling, as storage solutions are one of the technologies featured in it. This year it is about electric storage only, but thermal storage solutions are expected to play their part in the coming years. Generally speaking, it is fairly hard to keep track of new policies or even the amounts invested on the heating and cooling market because of the decentralised use of these technologies. The chapter about Investment Flows, in which the authors primarily rely on assessments by US-based consultancy Bloomberg New Energy Finance, does not yet include any data on renewable heating and cooling. The GSR2017 analysed 155 countries worldwide with the help of over 800 contributors. It includes market and industry sections on all renewable energies relevant in today’s marketplace: biomass, CSP, geothermal, hydropower, ocean energy, photovoltaics and wind. Last year´s GSR was referenced in 32 different languages and 1,800 news articles from around the world.